To be knowledgeable in every aspect of swimming pools so that any question asked by the customer will be answered in a professional and accurate manner. We will always take the time to explain the cause of the problem and how we propose to correct it. Our primary focus is to have happy customers with crystal clear, safe swimming pools so we spend the entire winter taking courses and training. There is always something to learn or improved techniques to better serve you and your pool. Through extensive and constant training, we have become Core Water Chemistry Specialists (Lowry School) and CPO certified (National Swimming Pool Foundation). With this foundation in swimming pool water chemistry, we have built an entire customer base on referrals and presently service 200+ pools with our MOBILE BALANCING PROGRAM. 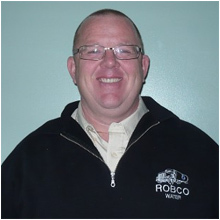 Using advanced technology and intense training, ROBCO WATER has become one of the leading companies for leak detection and isolation in the Ottawa area. For 10+ years, Robco Water has developed relationships with the leading pool equipment suppliers and has access to a complete inventory of pool equipment, parts, chemicals and anything pool related. We are happy to supply to you at a discount or you can take the opportunity to have our professional staff install any new equipment you require. We are pleased to announce the opening of a pool store in Hammond. We have limited space but we will stock all the supplies you will need for both SWIMMING POOLS and HOT TUBS including a water testing station using the Lamotte Spin Lab. This system uses a digital spectrometer to measure your water chemical levels and presents an accurate result with recommendations for proper balancing. No more 'guess strips' or bad balances saving you money.